A little over a year ago in this space, I wrote about my transformative experience viewing and photographing the northern lights in our area. Since then, I’ve observed the aurora borealis quite a few times, both from here and points further north. And I’ve become somewhat obsessed. Some people are fixated on the Packers; others, on craft beers. For me, it’s observing the luminous effects of sun-sent electrons blasting the Earth’s atmosphere. I am not alone. There are a lot of other people out there, just like me, who are fanatical about photographing the northern lights, including at least a dozen folks in the tri-county area who I always know are out there somewhere in the darkness along with me. We often alert each other to sightings or preferred locations and keep in constant contact via social media during major solar storms. Some people are fixated on the Packers; others, on craft beers. For me, it’s observing the luminous effects of sun-sent electrons blasting the Earth’s atmosphere. My diurnal friends can tell when I’ve been out late chasing the lights. I’m usually walking around zombie-like, looking as if I’d closed down The Joynt for a third night in a row. They often ask me where I was, how it looked, and “When will they be visible again?” I have to explain that it doesn’t work that way. While one can imprecisely forecast an elevated likelihood of the lights being active a day or so in advance by studying solar wind speed and interplanetary magnetic field data, they are largely unpredictable. If we’re lucky we may get eight to 10 decent aurora displays in a year in the Chippewa Valley. And there are a lot of potential barriers to fully experiencing them when they are out: clouds, a full moon, lack of child care, an important 8am meeting. So when they do show up, it is a treat that should not be wasted. Even if it isn’t always convenient for one’s comportment the following day. 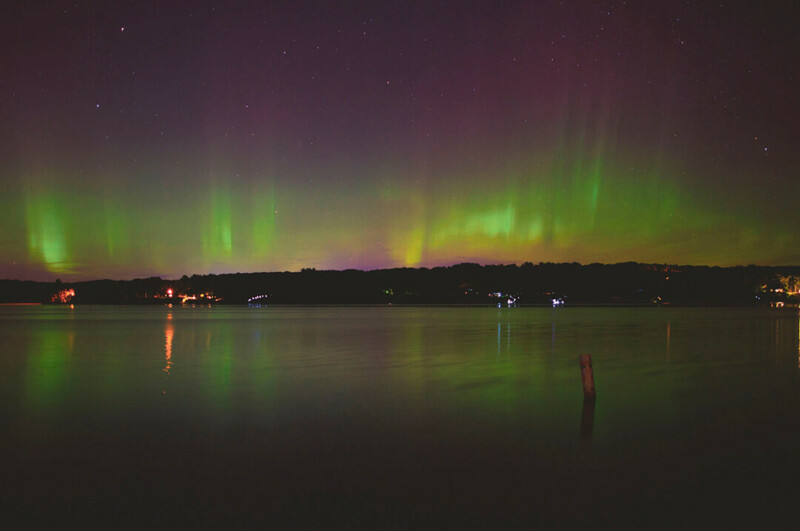 We recently had a three-day stretch where the northern lights were prominently visible in our area. I was traveling in the southeastern part of the state, so I missed most of the show. But based on the online chatter of my fellow fanatics I knew they were out in full force. So I texted a friend who’d never seen them – who happened to be vacationing in Duluth – and told him to keep his eyes to the skies. I also phoned home and asked my wife to alert our octogenarian next-door neighbors, Karen and Ted, who’d asked me for months to let them know when the lights would be visible. They bundled themselves up hours past their normal bedtime and drove east of town and looked up. I later learned that they saw nothing but stars. My friend in Duluth called to say that he saw what he thought might be the lights, but I could tell from the disappointment in his voice that he was unimpressed. It’s true. The northern lights around here aren’t anything like what you see on postcards from the Arctic. They rarely present with vibrant colors when viewed with the naked eye from our latitude. If you don’t know what you are looking for – or at – they can be easy to miss. Around these parts they usually appear as white, wispy clouds, or like a thin strand of slow-moving, semi-translucent smoke rising from an invisible industrial smokestack. When conditions are perfect, they seem to be dancing rhythmically to music apparently audible only in the heavens. They can also present as a dense fog layer or thick silvery haze arcing rainbow-like, but largely colorless, right above the northern horizon. In some cases, you may notice faint hints of green or purple, but usually they’re simply achromatic apparitions. The camera reveals color much better than our retinas, which is why photographing them is so special. Sadly, there will be no next time for Ted. Not three weeks after that near-miss on the beach, he passed away suddenly at his home. Like the northern lights, life itself is fleeting and unpredictable. While I’ll never be able to experience the lights with Ted, I like to imagine that he now has a front-row seat to spectacular shows. And I’ll never again take for granted any potential opportunity to see them. You just don’t know when – or if – another opportunity will come around.